This large painting is one of a set of four paintings I've done, based on Plate 79 , of the ABBOTT LEDGER. 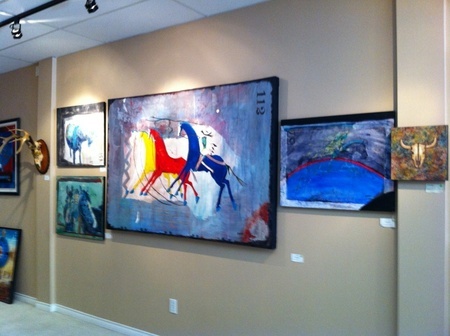 The large painting is 7 feet by 3.4 feet on canvas, the other three on wood panels. I find ledger art interesting because of it being part of using new found items (ledgers, paper, paints etc), being used to create art. That a people at war still created art as it is part of the importance of being human and using the visual voice. "This genre, often called Ledger Art, represents a transitional form of Plains Indian artistry corresponding to the forced reduction of Plains tribes to government reservations, roughly between 1860 and 1900. Due to the destruction of the buffalo herds and other game animals of the Great Plains by Anglo-Americans during and after the Civil War, painting on buffalo hide gave way to works on paper, muslin, canvas, and occasionally commercially prepared cow or buffalo hides. 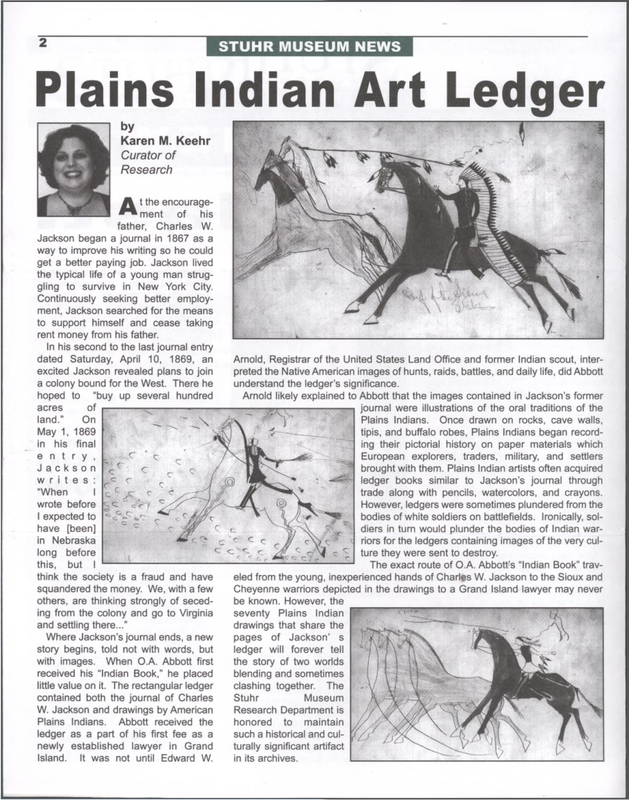 Changes in the content of pictographic art, the rapid adjustment of Plains artists to the relatively small size of a sheet of ledger paper, and the wealth of detail possible with new coloring materials, marks Plains ledger drawings as a new form of Native American art. As such, ledger painting portrays a transitional expression of art and material culture that links traditional (pre-reservation) Plains painting to the Plains and Pueblo Indian painting styles that emerged during the 1920s in Indian schools in Oklahoma and New Mexico. Beginning in the early 1860s, Plains Indian men adapted their representational style of painting to paper in the form of accountants ledger books. Traditional paints and bone and stick brushes used to paint on hide gave way to new implements such as colored pencils, crayon, and occasionally water color paints. Plains artists acquired paper and new drawing materials in trade, or as booty after a military engagement, or from a raid. Initially, the content of ledger drawings continued the tradition of depicting of military exploits and important acts of personal heroism already established in representational painting on buffalo hides and animal skins. As the US government implemented the forced relocation of the Plains peoples to reservations, for all practical purposes completed by the end of the 1870s, Plains artists added scenes of ceremony and daily life from before the reservation to the repertoire of their artwork, reflecting the social and cultural changes brought by life on the reservation within the larger context of forced assimilation". STUHR MUSEUM OF THE PRAIRIE PIONEER: Praised as "one of the top ’10′ places to relive America’s past” by Good Housekeeping magazine, the Stuhr Museum of the Prairie Pioneer is located in Grand Island, Nebraska and has done much to preserve and showcase the presence of the Plains Indians before, during and after contact. There is a comprehensive article on their site regarding the Abbott Ledger. It was written by Karen Keehr, she is a keen academic. 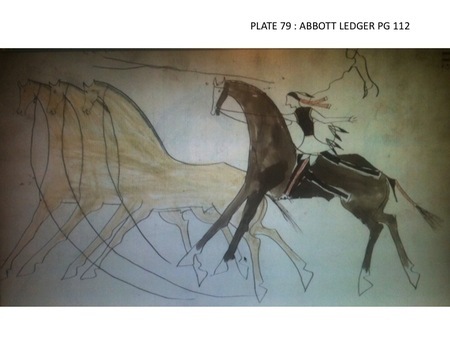 The entire Abbott Ledger, from which this painting was done, can be viewed here: ABBOTT LEDGER.